Occasionally, after a day immersed in reading about cars, writing about cars, driving in cars, sobbing in cars so no one can see my shame, and generally having my brain defined by cars, I'll have to step back and remind myself just why we even have cars at all. To get our asses and our information from one point to another. That's it. And, for the most part, that's what they all do. We're so used to it that we forget there was a time when the notion of being able to move that quickly was science fiction, but travel maps for the early part of the century indicate just how amazing modern travel is and just how quickly information moves these days. Whether it's a brand-new Porsche 911 or a 1985 Dodge Ares K car with two temporary spares it does the same damn thing, essentially the same way. It's pretty safe to say that thanks to cars (and other transportation machines, like airplanes) we take the way we move around for granted. Like, really, really for granted, bordering on yelling-at-your-mom-because-your-waffles-aren't-just-so ungrateful child territory. This fact smacked me, hard and wetly, when I saw the scanned pages of 1932's wild best-seller (note: not true at all) Atlas of the historical geography of the United States, by Charles O. Paullin, which Patrick noticed a few weeks ago. This fascinating old tome has a transportation section crammed with creamy-colored old maps, a number of which are labeled Rates Of Travel. What these maps show is the amount of travel time it would take to go from New York City to various locations in the United States for various years. Let's look at 1800 first. In 1800, travel in the US would be limited to mammalian power, either your own, higher-primate foot power or the considerably greater power of a willing horse. Steam-powered rail travel was still, at best, experimental concepts, with the first commercial rail line in the US not appearing until 1826. So how long did it take to get anywhere in this era? For our examples, let's use a trip from NYC to Detroit, since I'm heading to Detroit for the Auto Show in a day or so and it's on my mind already. 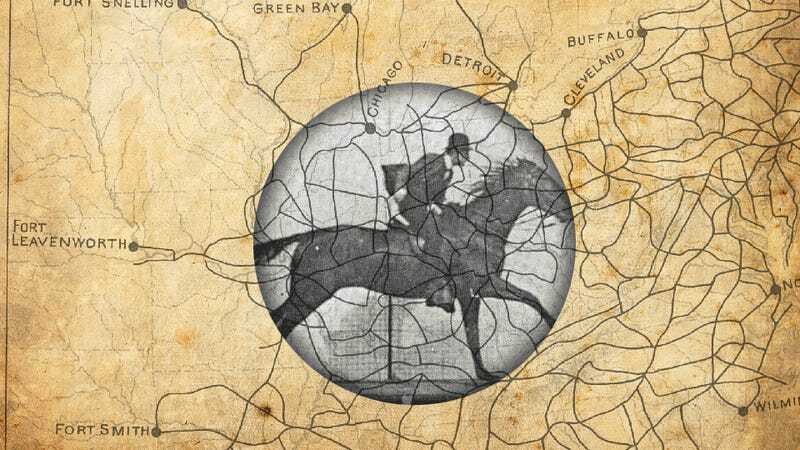 In 1800, a trip to Detroit from NYC (to see the International Horse-and-Buggy Show, perhaps) would have taken four weeks. That's four weeks for about 489 miles, as the crow flies. The actual distance would likely be greater, as a straight line from NYC to Motown would cut across a lake some would consider "great." On a modern aircraft, that same trip takes about an hour and a half, accounting for takeoff and landing time. So, let's do some comparative math here. Four weeks comes out to 672 hours, which is a tidy 670 hours and 30 minutes longer than flying in a 757. That means flying is right about 448 times faster than how you could get there in 1800. But maybe that's unfair, comparing flying to travel on rough terrain and poor roads averaging well under 1 mile per hour. So let's compare driving. Driving from NYC to Detroit, a distance of 614.6 miles, takes 9 hours and 22 minutes. That's averaging about 65 MPH, which seems entirely reasonable. That makes a modern car trip around 663 hours less than the 1800 time, which is around 72 times faster than the 1800 trip. That's a hell of a lot faster. Now, things did improve pretty dramatically; by 1830, you could have made the trip to Detroit in half the time, about two weeks. This improvement is largely due to railroads, which for the first time in human history, gave people an accessible way to travel at sustained high speeds (high being above 15 MPH or so) for long distances. By 1857, the rail network was so developed that our NYC-Detroit jaunt could be accomplished in two days, and by 1930 rail standards, one day. That's a pretty remarkable improvement for something that could happen within a person's lifespan. We've seen similar levels of development in other fields since then. Air travel went from a short hop on a Carolina beach to routine transoceanic flights in less than 50 years, and we've seen absurd developments in computing technology that let us carry in our pockets little shiny slabs that have more computing power than whole nations had 40 years ago. But, this incredible speeding up of human travel had to be one of the first great rapid technological booms. There's another set of maps in here that caught my eye that relates to the whole business of getting around the US: a road map. Road maps are probably the most common maps we encounter, and this one is interesting because it's both familiar and alien at the same time. It's a map of Post Roads, roads built and maintained for the primary purpose of giving mail carriers access to the country, as required by the constitution. This map is from 1804, and shows a surprisingly well-developed network of roads. What we're really looking at here, aside from being the great-grandfather of our national highway system, is the Internet of the early 1800s. The post road network was how almost all information was exchanged in the US at the time. Like today, you could send an email, though the "e" then stood for "equine" and it was just mail and I've exhausted the possibilities of that stupid bit of wordplay. But you get the idea. If we go along with the now/then speed computations I did with travel with information, and really, we may as well, the numbers get nice and ridiculous. Let's say a fresh, well-trained postal horse could run at 20 MPH, which means that's how fast one page of information (say, a one-kilobyte letter) could travel. A one kilobyte email travels at, oh, the speed of light, basically, so that's close to 670 million MPH. So, that means information now travels at 33,480,000 times as fast. I hope everyone now appreciates just how damn quick we are now.